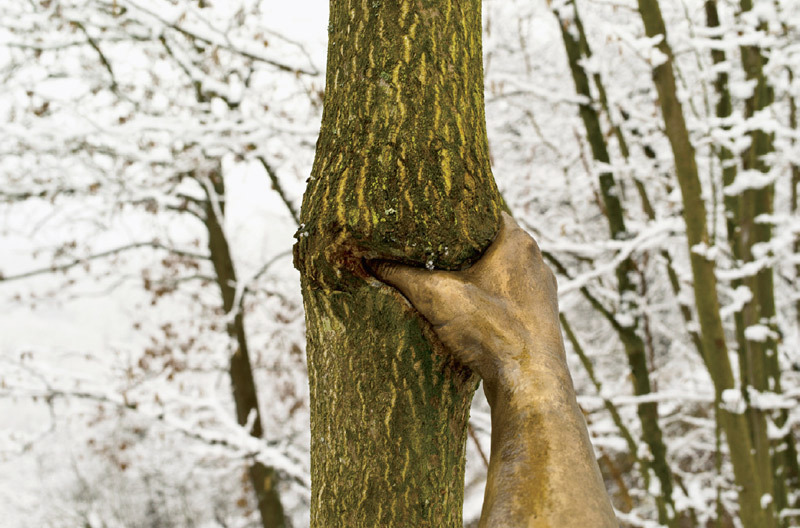 SINCE GIUSEPPE PENONE burst onto the Turinese art scene in the heyday of Arte Povera with a series of photographs documenting actions performed in the forested foothills of the Italian Maritime Alps, trees have remained central to his oeuvre. More than just a raw material, trees for Penone are organisms with a life force that he can work both with and against. In the “Alpi Marittime” project, begun in 1968, he interrupted the natural growth of saplings by introducing permanent markers of his presencea metal cast of his hand, or a wire silhouette of his body’s embracethe effects of which he documented for thirty years. Conversely, in the famous series “Ripetere il bosco” (Repeating the Forest), 1969–97, he recovered the “trees” hidden inside milled lumber by carving away the pulp around the hard knots that were once the living tree. This sustained attention to our relationship to nature is part of Penone’s poetic articulation of the tensions between tradition and technology that defined northern Italy as it shifted to an industrial economy after World War II. Critic Tommaso Trini has described Penone as belonging to the “Turin School” of Arte Povera, characterized by conceptual rigor and earnest investigation of the internal operations of works of art. Among his peers Giovanni Anselmo, Mario Merz, and Gilberto Zorio, Penone is distinctive for his intertwined physical and philosophical approach to the practice of sculpture, positing, for example, that the sculptor’s touch is analogous both to the organic formation of matter in nature and to the broader implications of human labor. In 1981, he made Essere fiume (To Be a River), two identical stones placed side by side, one taken from a riverbed, sculpted by the passage of water over its surface, the other a replica created by the artist. Such works as this, like the corporeal traces left on the “Alpi Marittime” trees, investigate the slow time of organic processes in counterpoint to technological speed, connecting human and geologic scales of time. On the summer solstice of this year, Penone presented Idee di pietra (Ideas of Stone), 2004/2010, the inaugural work of Documenta 13 (the exhibition proper opens in 2012). The piece comprises a bronze sculpture of a large tree with a stone lodged high in its branches, as well as a living sapling planted nearby. Speaking in Kassel at noon on the dedication day, the artist described the physical tensions between the two trees and the boulder in terms of his broader investigation into the philosophical and sensory divide between the practices of painting and sculpture. Afterward, I asked him to elaborate on these ideas and how they relate to the conventional notions of perception that are foundational for understanding one’s own being in the world. Giuseppe Penone, Alpi MarittimeContinuerà a crescere tranne che in quel punto (Maritime AlpsIt Will Continue to Grow Except at That Point), 1968/2003, tree, bronze; arm, 15 3/4 x 4 x 5 1/8". Installation view, Maritime Alps, near San Raffaele Cimena, Italy, 2008. PAINTING AND SCULPTURE are terms that indicate two expressive languages. Conventionally, sculpture is volume, and lives in space, while painting is surface, two-dimensionality. Sculpture is born from the imprint of feet in mud, painting from the imprint of handsdirty with mudon the walls of a cave. The conventional ways in which we describe these two modes are schematic and synthetic, and one can find many differences and similarities.